Pakistan's pace bowling legacy rests on the shoulders of the two Ws, who without a doubt, are a class above other pacers that have played the game. With over 1700 collective international wickets, Wasim Akram and Waqar Younis destroyed many a batting line up and to date remain the best fast bowlers to ever play for Pakistan. Arguably, the best in the world too. Since they left cricket over 10 years ago, Pakistan has produced plenty of fast bowlers who have tried to live up to the legacy of the two Ws. Shoaib Akhtar, Mohammad Asif, and Mohammad Aamer all showed glimpses of potential that could have taken them to the same heights, but their flaws had the better of them. Aamer may still have the chance, bur the former two will always be a what if for Pakistan cricket. However, this World Cup gave Pakistan a hero. A very unlikely bowling hero in another W - Wahab Riaz! Not only was Wahab Pakistan's leading wicket taker in the World Cup 2015, but against Australia he produced one of the most lethal fast bowling spells seen in the tournament, and arguably ever in ODIs. His first two overs produced wickets of David Warner and Michael Clarke, and his next 4 overs were purely hostile. Wahab's contest with Shane Watson is being talked about all over the world and it will forever be remembered as the best contest within a World Cup game. If were not for a dropped sitter at fine leg, Wahab may have won the match for Pakistan, and he may have taken them all the way. Wahab has had a chequered career. His 5 for in Mohali 4 years ago was a high point in his career, but in the four years since, he produced little for Pakistan, mostly failing to live up to the hype around him. He remained in and out of the Pakistan side, and largely remained a fast bowler who was easily hit around. In this World Cup however, Wahab picked himself up and raised his game to another level. He beat Zimbabwe single handedly and gave Pakistan a classic old fashion victory against South Africa. Both those performances came in must win pressure games for Pakistan. And then there was the spell against Australia. 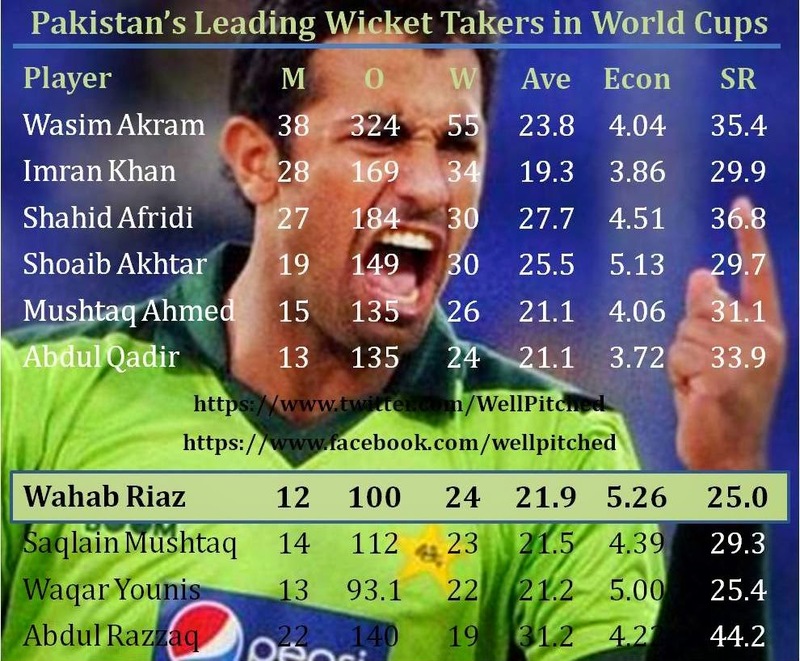 He is already the 4th highest wicket taker for Pakistan among pacers in World Cup matches. Only Wasim Akram, Imran Khan, and Shoaib Akhtar have more wickets than him. And he has played far lesser matches than the them. Wahab's average among Pakistan's pacers in World Cup matches is bettered by only Waqar Younis (slightly) and Imran Khan. He averages better than Wasim Akram, better than Shoaib Akhtar. And his Strike Rate is unmatched. A wicket every 25 deliveries puts Wahab head and shoulders above all other Pakistan bowlers in World Cups. In this World Cup, Wahab Riaz played with passion and aggression, and it was heartening for everyone to see a Pakistan pace bowler give his heart and soul to the team's cause. Pakistan may have lost the World Cup, but they have undoubtedly found a World Champion. The newly found world champion is now nearly 30 years old. If his body holds out the rigors of bowling at his pace, he will not last more than one ODI world cup.